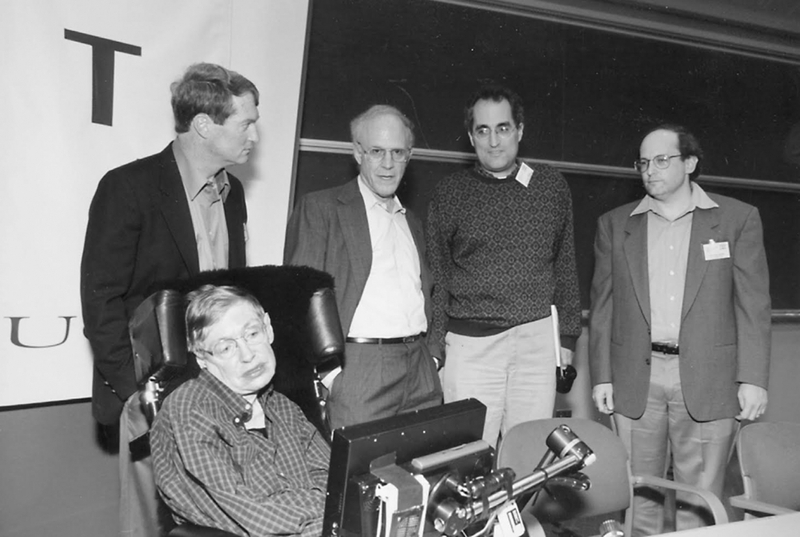 Stephen Hawking, front, at UCSB in 2001, with, from left to right, Joseph Polchinski of UCSB’s Kavli Institute for Theoretical Physics (KITP), David Gross, currently UCSB Chancellor’s Chair in Theoretical Physics at KITP; and Edward Witten and Paul Steinhardt of Princeton University. 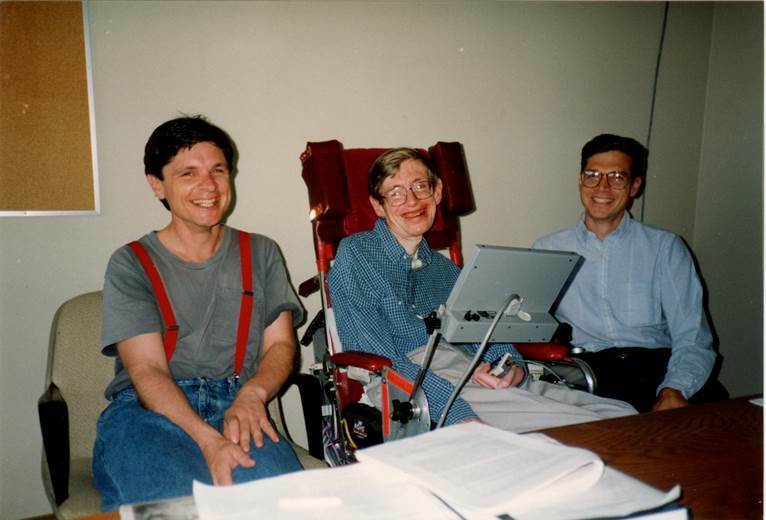 From left to right, former UCSB professor Andy Strominger (now at Harvard), Stephen Hawking and UCSB’s Gary Horowitz. Stephen Hawking onstage at UCSB’s Campbell Hall in the 1990’s. Hawking gave the inaugural KITP Public Lecture in 1994, filling the venue to capacity. From left: Gary Horowitz, James Hartle and Don Marolf. Stephen Hawking, who died Mar. 14 — Albert Einstein’s birthday and Pi Day — had a brilliant mind and a puckish sense of humor. Gary Horowitz experienced it firsthand. Now a UC Santa Barbara physicist, Horowitz was a postdoctoral scholar when Hawking invited him to Cambridge for six weeks. At a social gathering, Horowitz recalled, Hawking was the life of the party, telling jokes and proffering puzzles for people to solve. In a later visit to Cambridge, Horowitz saw up close Hawking’s memory at work. Other UCSB physicists who worked with Hawking also remember him for his sociability and recall, but, more importantly, for his keen insights into theoretical physics. “It was the totality of the interactions with Stephen that was the important thing for me,” said James Hartle, who worked with Hawking for decades. Among their many collaborations, the best known is a theory of the beginning of the universe. “Appreciating his keen insight into physics, the fact that he knew the right question to ask, the fact that he knew what to give up to provide an answer to that question, which was just as a hard as knowing the right question; his love of surprises. Hawking’s relationship with UCSB was longstanding, beginning in the 1980s. For many years, he was a regular visitor to campus. In 1994, Hartle, then director of the campus’s Kavli Institute for Theoretical Physics, launched a public lecture series to make physics accessible to a broad audience. Invited by Hartle to give the inaugural talk, Hawking did exactly that. He spoke to a capacity crowd at Campbell Hall. With an exchange program that brought Hawking’s students to UCSB and sent UCSB students to study with his group at Cambridge, Hawking had a direct impact on the study of physics at the Santa Barbara campus.